This salad is wonderful! Perfect in the summertime when your garden is bursting at the seams. There really are no set ingredients. Use what you have on hand. Color wise I've used sliced olive, or black beans. Red pepper strips or tomatoes. Yellow peppers or corn. The key to this salad is color. The more color, the prettier the salad, and I swear it tastes better too. The salad dressing is my old standby. 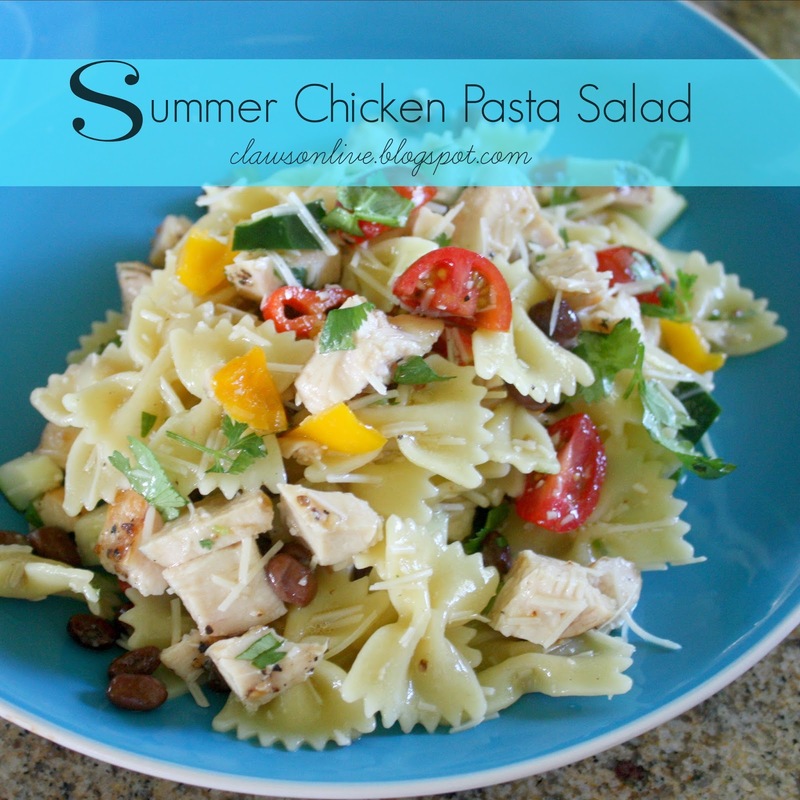 It appears in my Everything Salad as well as this pasta salad. Rotisserie chicken would be fabulous, or left over teriyaki chicken you had last night. Our favorite is fresh chicken bossoms cut into bite sized chunks and then fried in a little butter with salt and pepper. It may be a little indulgent, but my mom started with that little trick, and it's hard to do anything else. If you're like me this time of year, I struggle cooking at home. It's hot, and I'm just not up for a lot of preparation, or heavy eating. Both James and Emma here at my house could eat this salad every day. It is just perfect with a lovely slice of Great Harvest Sourdough Bread, or some homemade breadsticks. Bring all ingredients to a boil and immediately pull off heat. When the mixture has cooled add 1 c. vegetable oil. Shake until combined and pour over pasta salad ingredients. Top with shredded Parmesan Cheese. You can eat the salad cold or hot. It's good both ways.